Although not brought up in church as a young person, I still remember hearing folks say that an event had instilled the “fear of the Lord,” into them. My dad used to say, “That’ll make a believer out of you.” These statements led me to believe that in order to believe in God one had to quake and tremble as if God were some kind of tyrant with a switch ready to smack your hind quarters if you didn’t jump to it just right. Hard to be close to an image like that one. As I grew into an adult, I questioned this image and asked how we can feel protected, loved and in fellowship with an entity that utilizes punishment as a primary teaching tool. And as I study more about the God-man Jesus, I have come to see that the fear of the Lord may not mean we are to fear Him and feel punished by Him. Instead, I think we are to look at the situations where he too was fearful in order to adjust our thinking and come into identification with Christ. After all, isn’t that why He became human? He didn’t have to do that, you know. Unfortunately there are a lot of well-meaning Christians and churches telling us that fear is lack of faith or something else in our lives. I don’t know if I can in all honesty embrace that one when I read the story of Jesus in the garden before His arrest, conviction and death. He was asking His father if there was a way out of this plan. In all accounts of this part of Jesus’ life, one can feel the quaking terror as He asks this cup pass from Him before submitting to the Father’s will over His own. 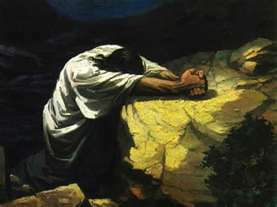 Does the fear of our Lord mean He was faithless or less able/willing to accept the fate that awaited Him? If He could utter these words from deep agony and despair, how can we condemn another, or ourselves, by placing the label “unfaithful”? Christ’s fear was woven with reality because He knew the outcome. I am often fearful because I do not know the outcome of an unsettling event. Does this mean I am faithless? Does this mean you are faithless? Some would say so. But what I am learning is that God knows I am afraid. He knows I fall into mistrust, attempted control and even downright anguish from time to time when faced with situations that may bring about an unpleasant or unwanted result for me or one I love. So in bucking up, lathering a situation up with quoted scripture or acting like I am the most faithful of all because I am not afraid, I lie to myself and to God. And I deny the healing balm of Christ because I don’t let Him minister to me out of an understanding and identifying heart. When I am busy putting on an act, I am missing the real deal – Christ understands my fear because He has been fearful. Christ says to you and to me, “I can relate beloved. I cried out in fear once and I am not condemning you for your fears or tears. Yeah, I know. I’ve been there too.” I am learning not to be in fear of the Lord but to identify with and be comforted by the authenticity of my Lord’s fear. I can rest in knowing that I am understood. Only then can I sit in the fear without shame and find the peace to wait until the answer comes, whatever it might prove to be. One Christian speaker/counselor-type a friend turned me onto suggests that “fear is the opposite of love” (as opposed to hate being the opposite of love) — this was on a teaching CD about relationships, in reference to the motivation behind others’ hurtful actions (they don’t hate you, and they aren’t evil; they’re just afraid). When I think of Jesus afraid in the Garden of Gethsemane, I wonder if the answer to his prayer was his Father filling him with so much love as to strengthen him to face the fear — a form of prayer that I pray with others facing surgery or other uncertainties. May God fill you with love today, Laura! Thanks Laurie. That is an interesting perspective. I can’t say I agree with a lot of what most counselors have to say but it is interesting to hear different takes on things. For me, calling a spade a spade is always my best avenue to the authenticity that authors healing. We all have different ideas. I wish you love in your heart too, and we are praying for answers to your own uncertain situations on many levels. Blessings.